Russia issued a new warning to Ukraine yesterday (23 September) saying Moscow could respond with protectionist barriers if its former Soviet ally joins a free trade pact with the European Union. Russia is worried it will be flooded by European goods if Ukraine removes import duties with the EU under agreements likely to be signed in November, but also fears Kyiv is making a pivotal shift away from Moscow. "This is Ukraine's choice and we have to respect it, but at the same time money has to be taken into account," First Deputy Prime Minister Igor Shuvalov told the Reuters Russia Investment Summit in Moscow. "If they have a stronger economy, it will be a plus, but only if it is not achieved by making us weaker." He denied Moscow was putting pressure on Kyiv or drawing up plans to retaliate. But he also said Russia would have to act "if there is evidence of dumping or the use of hidden forms (of protectionism) such as support for exports, support for agricultural producers". Shuvalov's remarks made clear Moscow had not been appeased by Ukrainian Prime Minister Mykola Azarov, who tried on Saturday to soothe Russian fears over planned agreements with the EU on political association and free trade. Azarov says Ukraine, whose economy is dominated by exports such as steel, chemicals and agricultural produce, would benefit almost immediately from lower duties on Ukrainian exports. Russian officials, led by President Vladimir Putin, say Ukraine has more to gain from joining a Customs Union grouping Russia, Kazakhstan and Belarus. Moscow is also holding out against Ukraine's pleas for cheaper Russian gas to help its hard-pressed economy. Moscow's efforts to persuade Kyiv not to move closer to the EU form part of a broader drive by Russia to deter former Soviet allies from edging out of its orbit and moving their economy and future trade towards western Europe. But Ukraine, a vast country with a population of 45 million and psychologically tied closely to Russia by history and shared culture, is the sorest point of contention. 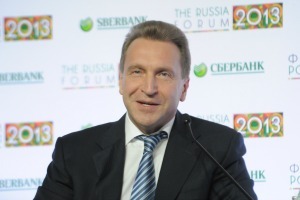 Shuvalov has played an important role in this drive in his government role overseeing relations with the former Soviet republics in the Commonwealth of Independent States (CIS). He said the Russia-led customs union would not suffer if Ukraine did not join, but its accession would create a trading bloc with a population of about 200 million. Reiterating that Kyiv could not join the customs union if it signed the free trade pact, because the two were legally incompatible, he said: "It's either one or the other." The 28-nation EU, which includes eastern European countries that were for decades under Soviet control, has made clear it will not give in to what it called Russian attempts to limit the "sovereign choices" of Ukraine and other countries. Kyiv still has one potential obstacle to overcome before any deals are signed with the EU – it has not bowed to pressure to release former Prime Minister Yulia Tymoshenko, a political rival of President Viktor Yanukovich who was jailed for abuse of office and is seen by the EU as a victim of "selective justice." But EU governments agreed in Brussels on Monday that, if they sign a political association agreement with Ukraine, they will speed up procedures for its implementation. Such agreements can take years to be ratified by member states but could now take immediate effect once Ukraine ratifies it, EU officials said. Ukraine's economy relies heavily on exports of steel, coal, fuel and petroleum products, chemicals and grain. More than 60% of its exports go to other former Soviet republics, with Russia, Belarus and Kazakhstan the most important. Enlargement and Neighbourhood Commissioner Štefan Füle said at the 10th Yalta Annual Meeting on 20 September that Ukraine was on “a good track” ahead of the Vilnius Eastern Partnership summit, where the country is expected to sign an Association Agreement (AA) containing a Deep and Comprehensive Free Trade Agreement (DCFTA) with the EU. “The progress made […], particularly in the recent weeks and last few months, is unprecedented. And it is not only my view. In the Council of Europe, the Venice Commission and other organisations – what a pleasure it is to talk there about Ukraine these days,” Füle said. The Commissioner also said that “something remarkable” had happened lately between the Ukrainian government and opposition, with a new consensus on the need of the country to integrate with the EU. “The cross-party consensus that was generated in Verkhovna Rada [the Parliament], the number of votes on Europe-related pieces of legislation, is unprecedented. I hope very much that this is a promise for the future and that the European agenda will always stay above party interests as it reflects the strategic interests of this country,” Füle said. The Commissioner also said that the EU would be doing its utmost for the AA and DCFTA not to be seen as a threat but as an opportunity by Russia. "We are working on overcoming the issue of legal incompatibility between the Association Agreement and Customs Union? Of course we are. And the issue of incompatibility is not a geopolitical game, it is a practical issue […]We have a sincere intention to do anything possible - whether we talk about tariffs or regulatory framework – to prevent new walls in Europe. We cannot afford them, Russia cannot afford them," Füle said. “The Vilnius summit is going to be a game changer. I hope we will be in the position to see the European Union and Ukraine signing the most powerful transformative instrument after enlargement – the Association Agreement/DCFTA,” the Commissioner stated. "In Verkhovna Rada (the Parliament) when it comes to eurointegration laws, over 300 MPs vote for them, which is the constitutional majority. That is, the parliament has very strong consensus in terms of European integration. Both Vitaliy Klychko (UDAR) and Arseniy Yatsenyuk (Batkivschyna) said that now it is their main goal. So, I don't expect any problems with the adoption of these draft laws. However, to adopt some of them we need to amend the Constitution, and therefore, their adoption gets postponed until the constitutional reform is conducted. Today there is much to improve in the mechanism of Ukraine-Russia relations. And I think when political passions around the signing of the Association Agreement cool down a little bit, we will have to build relations with Russia already with due regard to those opportunities which free trade between Ukraine and the EU will open. Since it is not only a powerful factor for the development of trade between Ukraine and the EU, but also a positive factor for Russia and Russian producers. I am sure that the signing of the Association Agreement between Ukraine and the EU will have a positive effect both on political and economic relations with the Russian Federation. We understand that today the Russian policy on the Association is based on some sentiments. I believe after the fact of signing of the Agreement this factor will disappear, and we will be able to come down to the further development of our relations more rationally and pragmatically". Russia is showing increasing signs of nervousness as the 28-29 November Eastern partnership summit in Vilnius approaches. The summit is expected to see the signature of a landmark Association Agreement and trade pact between the EU and Ukraine, and the initialling of similar agreements with Moldova and Georgia. These countries, along with Belarus, Azerbaijan and Armenia, are all members of the EU’s Eastern partnership initiative. Instead of becoming part of the EU market, Russia wants those countries to join its Customs Union, which only Belarus and Kazakhstan have joined until now. Under Russian pressure, Armenia has reportedly also agreed to join the Customs Union although the decision has not yet been formalised. Deutsche Welle: ???????? ??????? ???????????? ???????? ?????? ?? ??????? BBC Ukraine: ???? : ?????? ????????? ?????? ? ????????? ? ??????? ? ?????????????? Unian, Ukraine: ? ?????? ?????? ??????? ?????????? ???????? ??????? Zerkalo nedeli, Ukraine: ????????? ?????????? ???????? ? ????????????? ?????? ???? ????????? ??? ?????????? ? ?? An ex-superpower is always a sorry spectacle. They simply can’t abandon their ambitions – although they had to do it long ago.